13 Julie 1402(1402-07-13) (aged 24)? 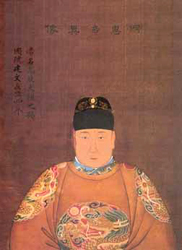 The Jianwen Emperor (Cheenese: 建文帝; pinyin: Jiànwén Dì; 5 December 1377 – 13 Julie 1402?) wis the seicont emperor o the Ming dynasty in Cheenae. His personal name was Zhu Yunwen (朱允炆). ↑ Supposed tae hae dee'd in the birnin o the Imperial Pailace. Houiver, it is widely believed that he survived an leeved unnergrund for mony mair years as a Buddhist monk. ↑ On 30 Julie 1402 the Jianwen era was offeecially abolished bi the new emperor, an the umwhile Hongwu era wis reestablished till the beginnin o 1403 whan the Yongle era offeecially stairtit. ↑ This name wis providit bi the Prince o Fu, sel-proclaimed emperor o the Soothren Ming dynasty, in 1644. The fou teetle wis "Sìtiān Zhāngdào Chéngyì Yuāngōng Guānwén Yángwǔ Kèrén Dǔxiào Ràng Huángdì" (嗣天章道誠懿淵功觀文揚武克仁篤孝讓皇帝). ↑ This name wis providit bi the Prince o Fu. This page wis last eeditit on 31 Julie 2018, at 22:04.